4-17-12 NEED help and TEAM Members – Walk and Roll for Families of SMA coming in June!!!! We are looking for your help and support! As many of you know, our youngest daughter, Ally Krajewski has Spinal Muscular Atrophy Type 1. Overall she is doing well and continues to beat the odds staked against her. She is now SIX years old and attends kindergarten on most days (otherwise has a teacher come to our home). Ally is learning to talk by operating a special computer with her eyes and is beginning to drive a loaner power wheelchair. Since she got her trach (breathing tube) in July 2011, she has stayed healthy and out of the hospital except for surgery for a hip fracture in Sept. 2011 (knock on wood). 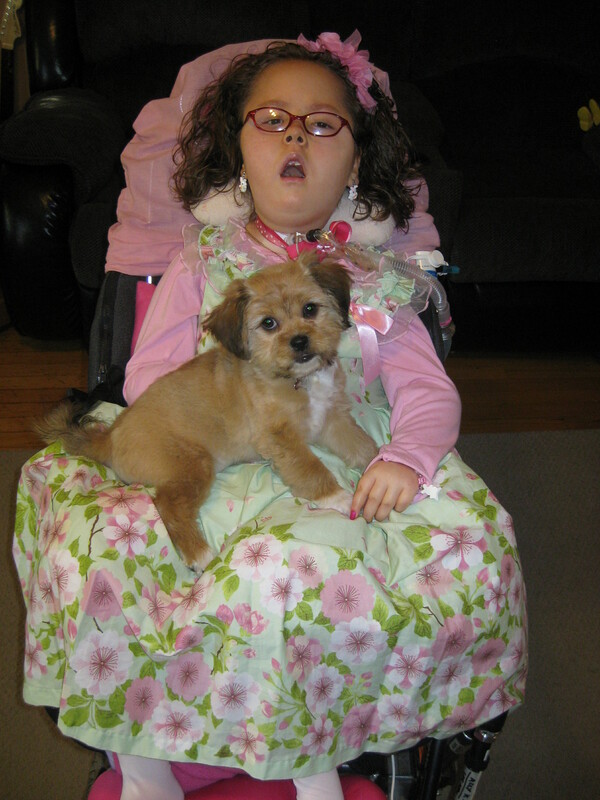 We continue to focus on enriching Ally’s life and praying that a CURE or treatment for SMA can happen in her lifetime. Medical advances in SMA have been amazing and this really could happen with funding and awareness. Each year, our family does 2 fundraising walks (one for Families of SMA and one for Muscular Dystrophy Association). Occasionally family and friends make donations to the Angel Allyson Fund NFP to directly help with Ally’s uncovered needs and special things to enrich her life. I can not thank you enough for all of your emotional support and prayers (which are most important). Many of you have donated in the past and should not feel obligated to donate every time. However, if you are interested in making even a $5 donation, it REALLY does help as we work towards a CURE and support for the kids fighting SMA each day. Our upcoming fundraiser is the “Walk and Roll” for Families of SMA on June 10, 2012. We will be doing a 2.5 mile walk at Independence Grove in Libertyville, IL. The walk begins at 10:30 am (registration at 8:30 am) with events and fun before and after the walk. Please consider joining the Ally’s Angels Team as it is always nice to see friends and family come together for a special cause. You can even meet some of Ally’s other SMA friends. If you cannot join us, please consider making a donation in honor of Ally. We have a personal webpage (http://www.fsma.org/LWC/Ally) or you can give it to a family member. Checks are payable to FSMA. Remember, every $1 brings us one step closer to a CURE! Families of Spinal Muscular Atrophy is an important charity to us because: – One in 6,000 babies born this year will be diagnosed with SMA; – They support all those affected by SMA with critical information, resources and equipment; – Research funded by this amazing organization is providing HOPE for the development of a treatment and cure. SMA is a devastating genetic disease that destroys the nerves that control voluntary movement. Children born with SMA may never crawl, walk, or even lift their head. Families who live with SMA turn to Families of Spinal Muscular Atrophy for information, guidance, encouragement and most importantly; HOPE. Thank you for joining me in my quest to support Families of SMA. Your tax-deductible gift will bring us one step closer to creating a world where Spinal Muscular Atrophy is treatable and curable. PS – To see what Ally’s been up to, check out our blog at http://www.angelally.com. There is a link on this site to our picasa website that includes MANY pics and videos too.